Rainy days won~t get them down in the 1964 Pac Strap from SOREL Kids! Waterproof suede leather. Dual hook-and-loop closure for easy on and off. Sherpa Pile snow cuff. Seam-sealed waterproof construction keeps out the wet elements. 9mm recycled felt inner boot is removable for easy washing. Cushioned textile footbed for added comfort. 2.5mm bonded felt frost plug midsole. Waterproof vulcanized rubber shell with herringbone outsole. Imported. Measurements: Heel Height: 1 2 in Weight: 10 oz Shaft: 6 in Product measurements were taken using size 4 Toddler, width M. Please note that measurements may vary by size. Weight of footwear is based on a single item, not a pair. 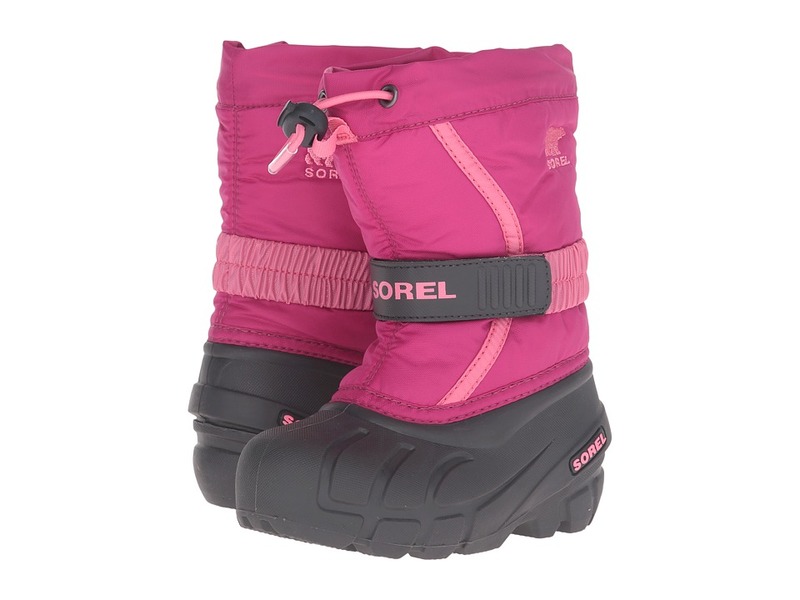 The style and warmth to get them through the season, in the Yoot Pac TP from SOREL Kids! PU coated leather upper. Seam-sealed waterproof construction. Drawstring with barrel lock closure. Sherpa Pile snow cuff. Removable 9mm Thermoplus felt innerboot. 2.5mm bonded felt frost plug midsole. Handcrafted waterproof vulcanized rubber with herringbone outsole. Temperature rated: -40&amp#186F/-40&amp#186C Imported. Measurements: Weight: 1 lb 5 oz Shaft: 9 in Product measurements were taken using size 2 Little Kid, width M. Please note that measurements may vary by size. Weight of footwear is based on a single item, not a pair. 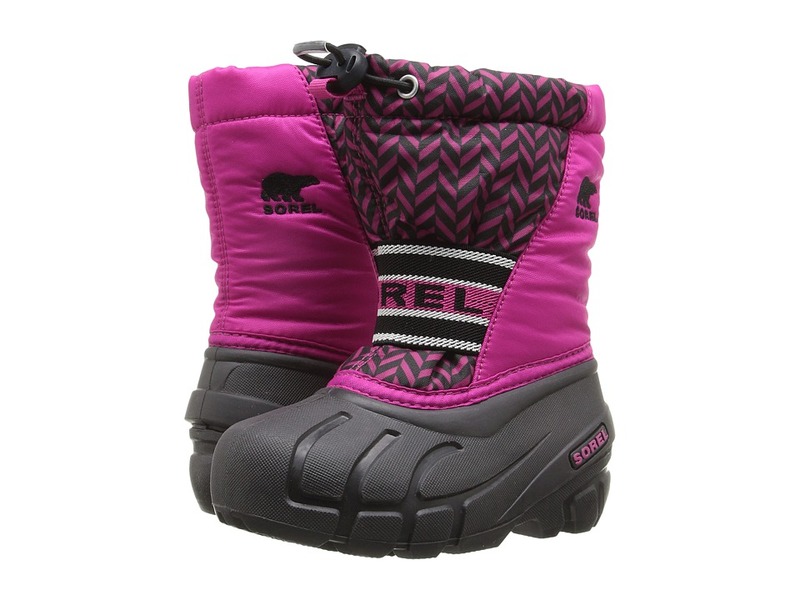 The style and warmth to get them through the season, in the Yoot Pac TP from SOREL Kids! PU coated leather upper. Seam-sealed waterproof construction. Drawstring with barrel lock closure. Sherpa Pile snow cuff. Removable 9mm Thermoplus felt innerboot. 2.5mm bonded felt frost plug midsole. Handcrafted waterproof vulcanized rubber with herringbone outsole. Temperature rated: -40&amp#186F/-40&amp#186C Imported. Measurements: Heel Height: 1 2 in Weight: 1 lb Shaft: 9 1 2 in Product measurements were taken using size 13 Little Kid, width M. Please note that measurements may vary by size. Weight of footwear is based on a single item, not a pair. 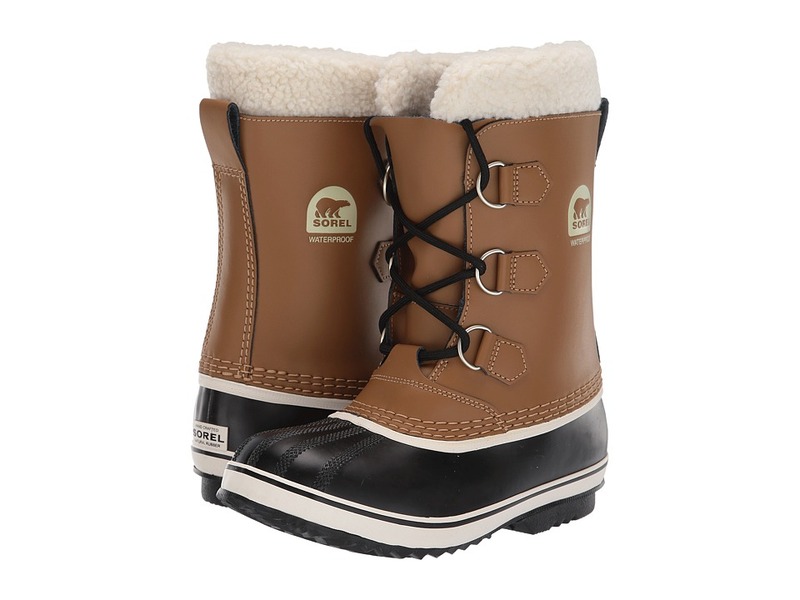 The snow is no match for this great looking waterproof boot. Nylon upper. Warm acrylic blend snow cuff. Drawstring with barrel lock closure. Front lacing system for custom fit. Removable 9mm Thermoplus felt inner boot. Handcrafted waterproof vulcanized rubber shell with herringbone outsole. Temperature rated: -40&amp#186F/-40&amp#186C. Imported. Measurements: Weight: 1 lb 3 oz Shaft: 9 1 4 in Product measurements were taken using size 2 Little Kid, width M. Please note that measurements may vary by size. Weight of footwear is based on a single item, not a pair. 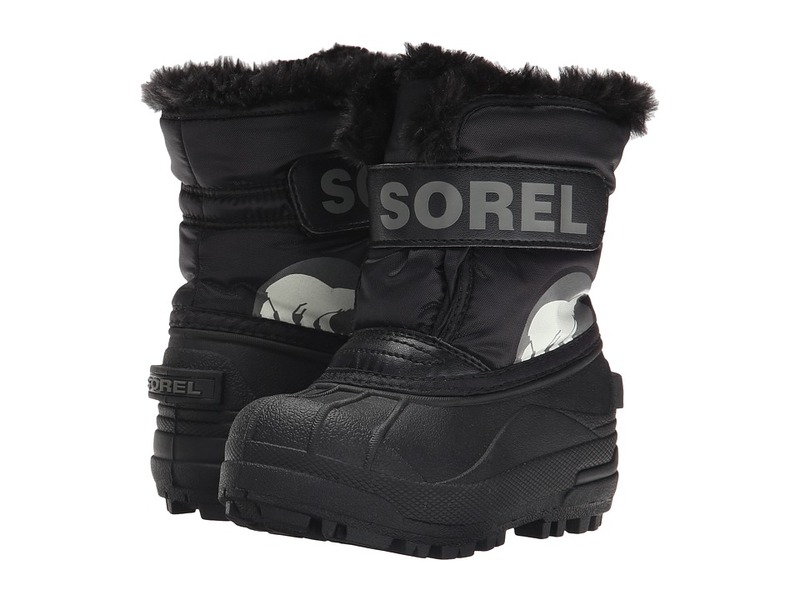 The style and warmth to get them through the season, in the Yoot Pac TP from SOREL Kids! PU coated leather upper. Seam-sealed waterproof construction. Drawstring with barrel lock closure. Sherpa Pile snow cuff. Removable 9mm Thermoplus felt innerboot. 2.5mm bonded felt frost plug midsole. Handcrafted waterproof vulcanized rubber with herringbone outsole. Temperature rated: -40&amp#186F/-40&amp#186C Imported. Measurements: Heel Height: 1 2 in Weight: 13 oz Circumference: 12 1 2 in Shaft: 6 1 2 in Product measurements were taken using size 9 Toddler, width M. Please note that measurements may vary by size. Weight of footwear is based on a single item, not a pair. 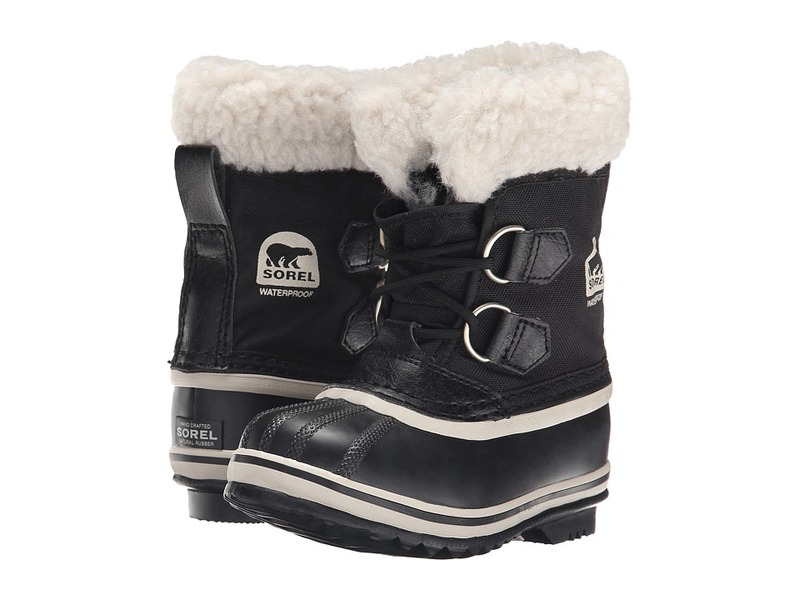 Direct their snow-time playtime in the warm and comfy Snow Commander from SOREL Kids! Durable water- and wind-resistant PU coated synthetic textile upper. Injection-molded waterproof thermal rubber shell. 200 grams of insulation keeps their feet nice and toasty. Slip-on style with hook-and-loop ankle strap. Opens extra wide to make it super easy to get on and off busy little feet. Fleece lining with faux fur cuff. 25 mm bonded felt frost plug midsole. Rubber outsole with multidirection lug outsole for traction enhancement. Temperature rated to -32&amp#176F/-25&amp#176C. Imported. Measurements: Heel Height: 1 in Weight: 11 oz Shaft: 5 1 2 in Product measurements were taken using size 8 Toddler, width M. Please note that measurements may vary by size. Weight of footwear is based on a single item, not a pair. 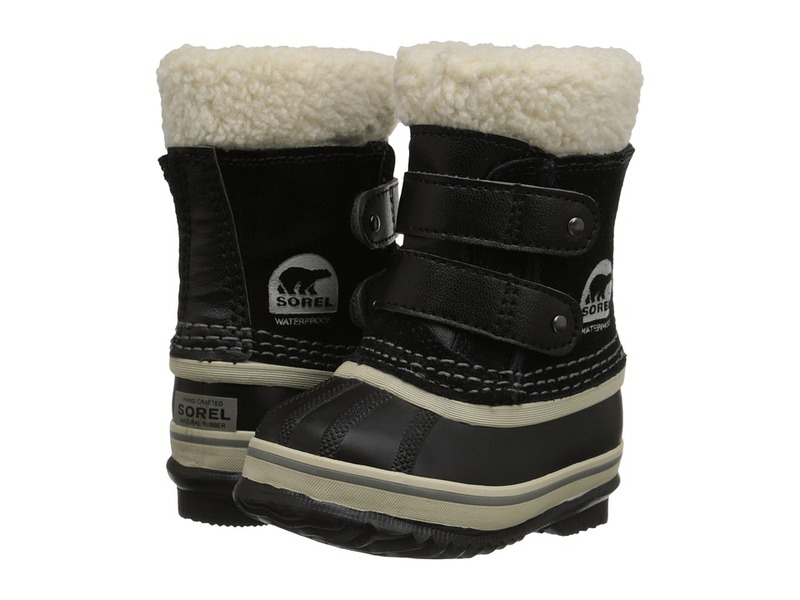 Direct their snow-time playtime in the warm and comfy Snow Commander from SOREL Kids! Durable water- and wind-resistant PU coated synthetic textile upper. Injection-molded waterproof thermal rubber shell. 200 grams of insulation keeps their feet nice and toasty. Slip-on style with hook-and-loop ankle strap. Opens extra wide to make it super easy to get on and off busy little feet. Fleece lining with faux fur cuff. 25 mm bonded felt frost plug midsole. Rubber outsole with multidirection lug outsole for traction enhancement. Temperature rated to -32&amp#176F/-25&amp#176C. Imported. Measurements: Weight: 8 oz Shaft: 5 1 4 in Product measurements were taken using size 4 Toddler, width M. Please note that measurements may vary by size. Weight of footwear is based on a single item, not a pair. A rugged work boot with serious style. Waterproof, full-grain leather upper. Seam-sealed construction. Pull-on Chelsea closure. Soft textile liner topped with felt. 100g insulation. Removable EVA footbed. Molded rubber outsole. Imported. Measurements: Weight: 1 lb 5 oz Shaft: 6 in Product measurements were taken using size 12, width D - Medium. Please note that measurements may vary by size. Weight of footwear is based on a single item, not a pair. On your next trip to the snow country, be sure your boots are up the task! The Blizzard XT boot is constructed of durable, waterproof textiles. Drawstring with barrel lock closure system. Omni-Heat reflective lining. Removable 9mm recycled felt inner boot. 25 mm bonded felt frost plug. 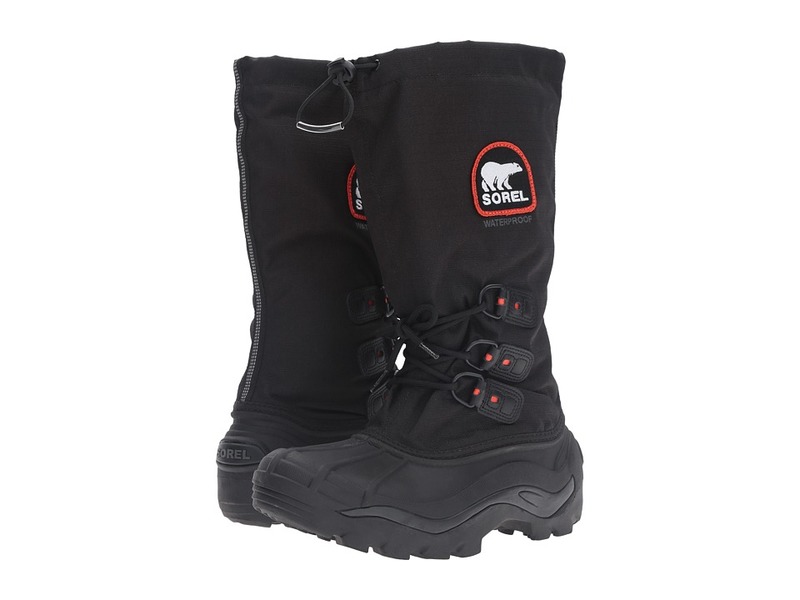 Waterproof vulcanized rubber shell with Sorel aero-trac non loading outsole. Rated: -40&amp#176 F. Imported. Measurements: Heel Height: 1 in Weight: 2 lbs 9 oz Shaft: 14 1 2 in Platform Height: 1 2 in Product measurements were taken using size 12, width D - Medium. Please note that measurements may vary by size. Weight of footwear is based on a single item, not a pair. 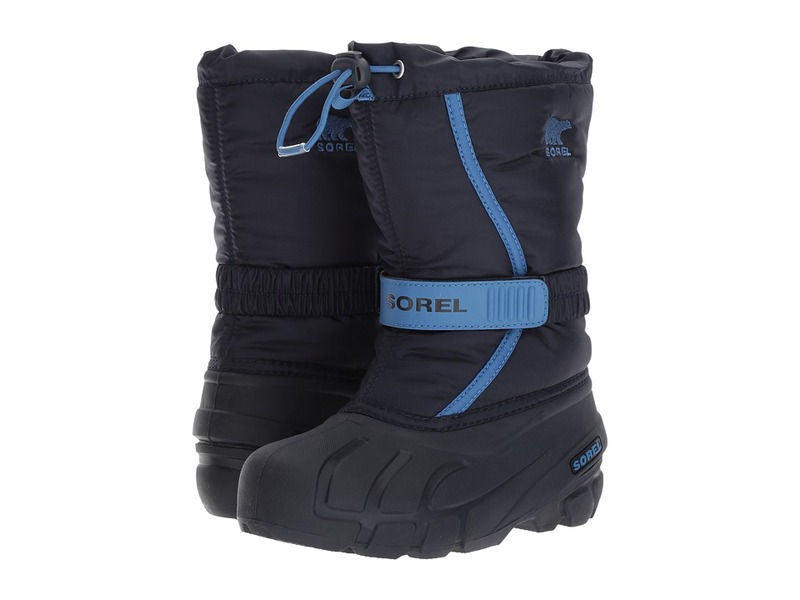 Keep extreme conditions at bay with the Sorel Alpha Pac II boot protecting you all day long. Waterproof PU-backed synthetic textile upper. Polar Lite shell for enhanced flexibility in extreme temperatures. Reflective safety graphics keep you visible in low lighting. Features a built in gaiter with barrel lock closure system for a secure fit. Shatter-resistant YKK Shokonloc buckle closure at collar. 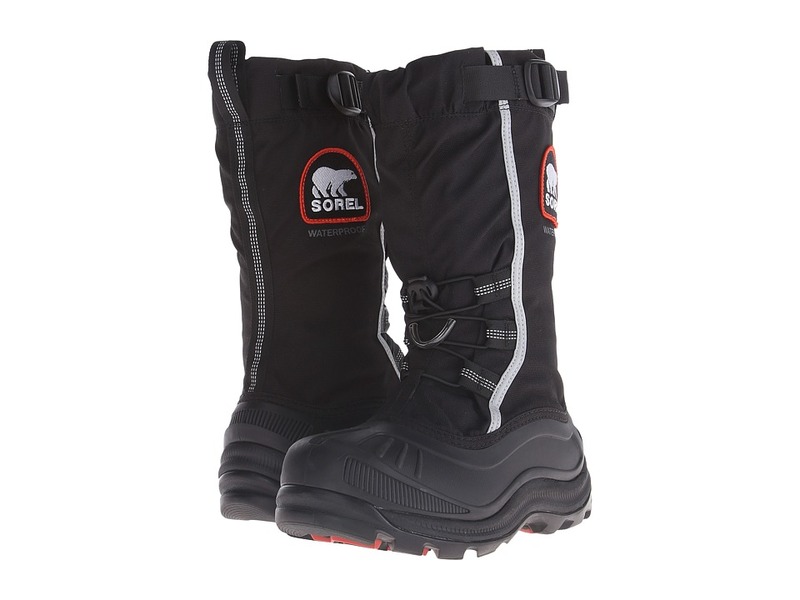 Removable 9mm recycled felt inner boot with Omni-Heat reflective lining provides superior protection against the cold. Cushioned 9 mm felt footbed provides all-day comfort. Molded EVA midsole offers enhanced comfort, a lightweight feel and thermal protection. 2.5 mm bonded felt frost plug offers a little extra warmth and protection in the midsole. Durable rubber outsole with multidirectional rubber lug pattern for excellent traction. Temperature rated: -60&amp#176 F/ -51.5&amp#176 C. Imported. Measurements: Weight: 1 lb 10 oz Circumference: 17 in Shaft: 11 1 2 in Product measurements were taken using size 7, width B - Medium. Please note that measurements may vary by size. Weight of footwear is based on a single item, not a pair. 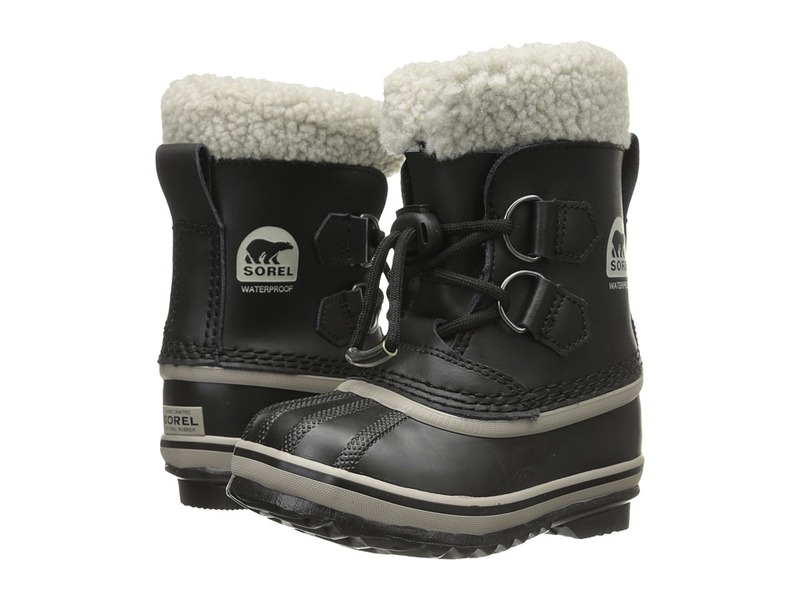 The cold-weather play never ends in the SOREL Kids Tofino II boot. Durable, quilted textile upper with waterproof suede leather overlays. Lace-up closure with D-ring eyelets. Hardy, protective rubber shell. Faux fur snow cuff for a touch of added style and warmth. 100 grams of insulation helps lock in warmth. Comfortable textile lining. Textile-covered footbed. Waterproof vulcanized rubber shell. Rubber outsole provides excellent traction. Imported. Measurements: Weight: 14 oz Shaft: 8 in Product measurements were taken using size 1 Little Kid, width M. Please note that measurements may vary by size. Weight of footwear is based on a single item, not a pair. Rainy days won~t get them down in the 1964 Pac Strap from SOREL Kids! Waterproof suede leather. Dual hook-and-loop closure for easy on and off. Sherpa Pile snow cuff. Seam-sealed waterproof construction keeps out the wet elements. 9mm recycled felt inner boot is removable for easy washing. Cushioned textile footbed for added comfort. 2.5mm bonded felt frost plug midsole. Waterproof vulcanized rubber shell with herringbone outsole. Imported. Measurements: Weight: 9 oz Shaft: 5 3 4 in Product measurements were taken using size 4 Toddler, width M. Please note that measurements may vary by size. Weight of footwear is based on a single item, not a pair. Catch all the flurries in the SOREL Kids Flurry! Waterproof and wind-resistant PU coated synthetic textile upper. Adjustable hook-and-loop instep strap. Gusset tongue keeps debris out. Sherpa pile snow cuff. Built-in gaiter. Removable felt liner. Removable 6 mm washable recycled felt inner boot. 25 mm bonded felt frost plug midsole. Multi-directional lug sole. Injection molded waterproof thermal rubber shell with multi-directional lug outsole for enhanced traction. -32&amp#186 Fahrenheit / -25&amp#186 Celsius. Imported. Measurements: Weight: 11 oz Circumference: 11 in Shaft: 7 1 2 in Product measurements were taken using size 9 Toddler, width M. Please note that measurements may vary by size. Weight of footwear is based on a single item, not a pair. Catch all the flurries in the SOREL Kids Flurry.! Waterproof and wind-resistant PU coated synthetic textile upper. Adjustable hook-and-loop instep strap. Gusset tongue keeps debris out. Sherpa pile snow cuff. Built-in gaiter. Removable felt liner. Removable 6 mm washable recycled felt inner boot. 25 mm bonded felt frost plug midsole. Multi-directional lug sole. 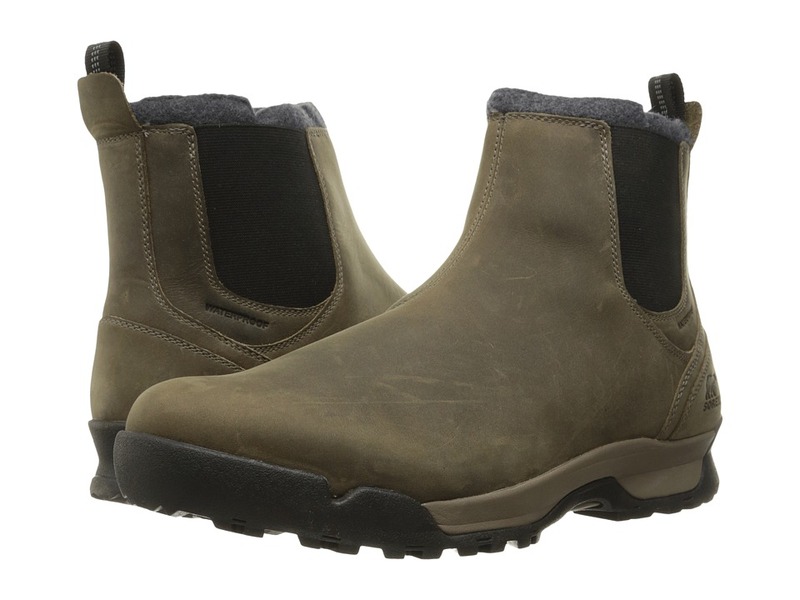 Injection molded waterproof thermal rubber shell with multi-directional lug outsole for enhanced traction. -32&amp#186 Fahrenheit / -25&amp#186 Celsius. Imported. Measurements: Weight: 10 oz Circumference: 11 in Shaft: 7 1 2 in Product measurements were taken using size 8 Toddler, width M. Please note that measurements may vary by size. Weight of footwear is based on a single item, not a pair. 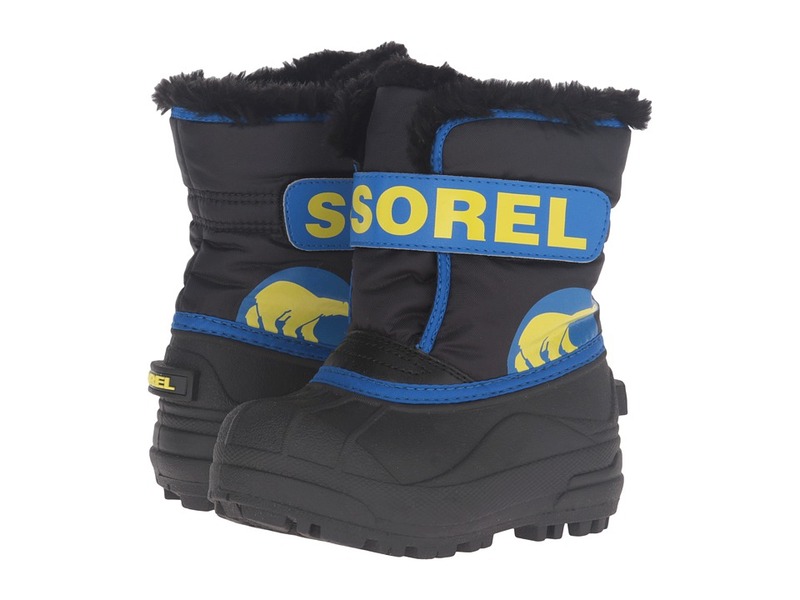 Keep your little cub warm and comfortable with the SOREL Kids Cub! Durable water and wind resistant PU coated synthetic upper. Pull-on construction with drawstring adjustment at collar. Fixed elastic instep strap for a snug fit. Rivets along vamp keep water moving away from their boots. 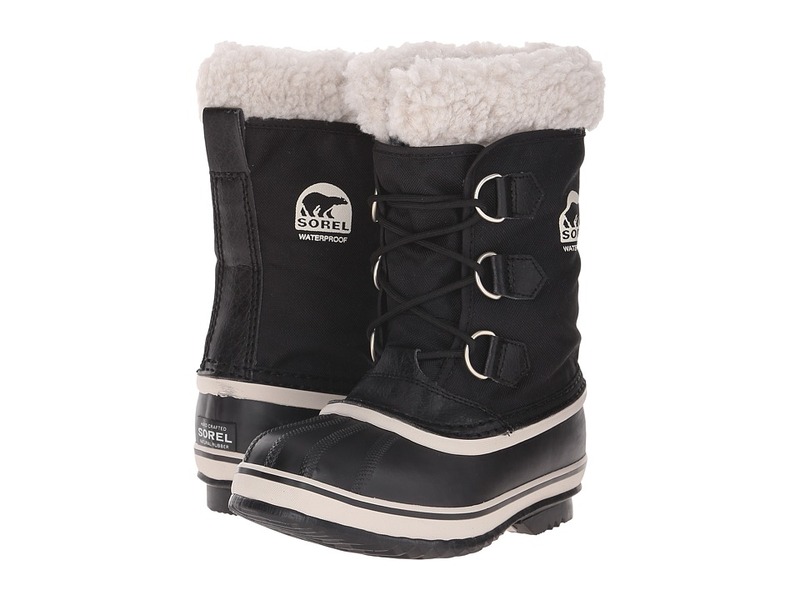 Removable 6 mm washable ThermoPlus recycled felt inner boot for toasty warmth. Injection molded thermal rubber shell. 2.5 mm bonded felt frost plug midsole creates a thermal barrier between their feet and the cold. Traction-enhancing multi-directional rubber lug outsole. Temperature rated: -25&amp#176F/-32&amp#176C Imported. Measurements: Weight: 11 oz Shaft: 7 in Product measurements were taken using size 9 Toddler, width M. Please note that measurements may vary by size. Weight of footwear is based on a single item, not a pair. 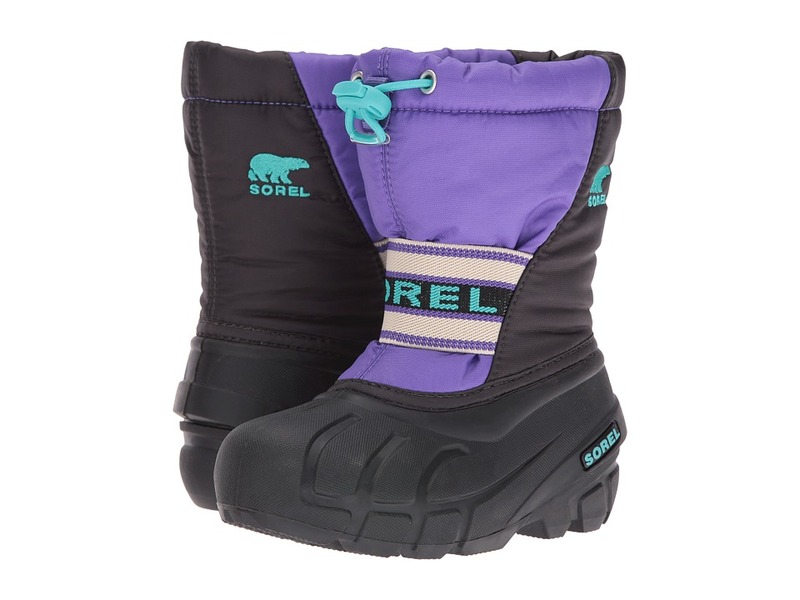 Keep your little cub warm and comfortable with the SOREL Kids Cub! Durable water and wind resistant PU coated synthetic upper. Pull-on construction with drawstring adjustment at collar. Fixed elastic instep strap for a snug fit. Rivets along vamp keep water moving away from their boots. 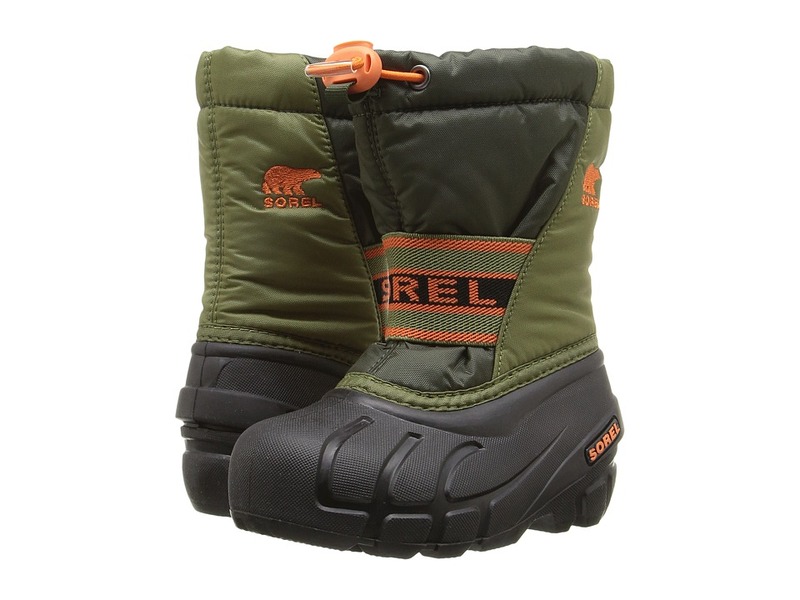 Removable 6 mm washable ThermoPlus recycled felt inner boot for toasty warmth. Injection molded thermal rubber shell. 2.5 mm bonded felt frost plug midsole creates a thermal barrier between their feet and the cold. Traction-enhancing multi-directional rubber lug outsole. Temperature rated: -25&amp#176F/-32&amp#176C Imported. Measurements: Weight: 15 oz Circumference: 13 in Shaft: 9 1 4 in Product measurements were taken using size 2 Little Kid, width M. Please note that measurements may vary by size. Weight of footwear is based on a single item, not a pair. 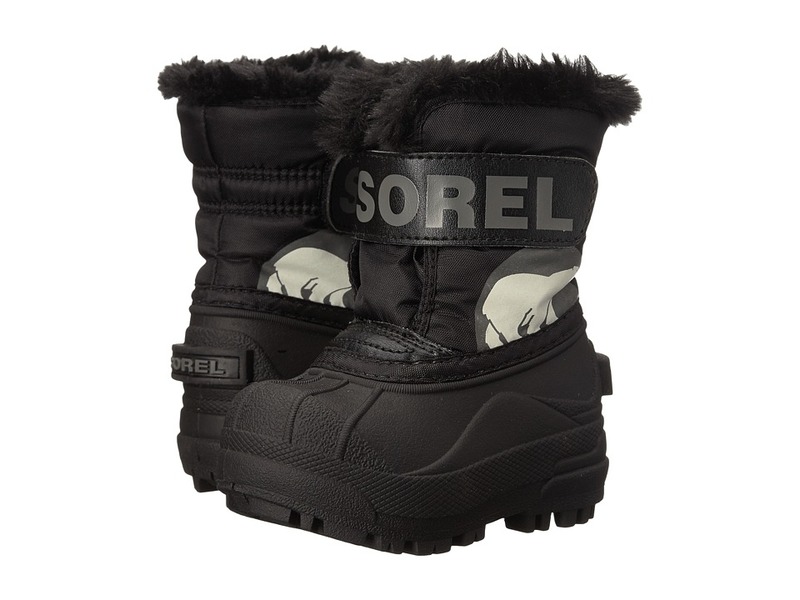 Keep your little cub toasty and secure this winter with the SOREL Kids Cub Graphic 15! PU-coated synthetic upper battles against the elements, keeping you protected from wind and water. Pull-on construction with built-in gaiter and barrel lock closure. Removable, washable liner that is made from recycled materials. Fixed elastic instep strap. Injection-molded waterproof thermal rubber shell. Rubber lugged outsole offers multi-directional traction. -32&amp#186C/-25&amp#186F temperature rated. Imported. Measurements: Weight: 11 oz Circumference: 9 1 4 in Shaft: 6 3 4 in Product measurements were taken using size 9 Toddler, width M. Please note that measurements may vary by size. Weight of footwear is based on a single item, not a pair. 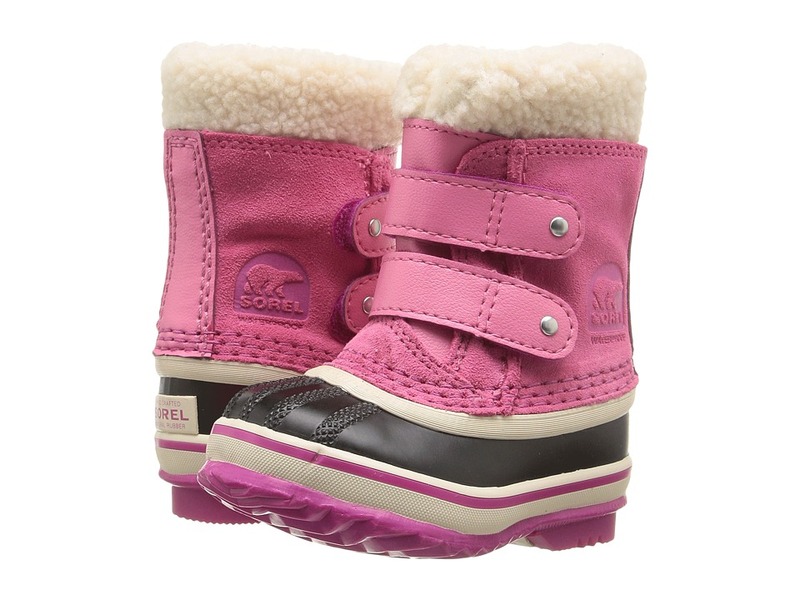 Direct their snow-time playtime in the warm and comfy Snow Commander from SOREL Kids! Durable water- and wind-resistant PU coated synthetic textile upper. Injection-molded waterproof thermal rubber shell. 200 grams of insulation keeps their feet nice and toasty. Slip-on style with hook-and-loop ankle strap. Opens extra wide to make it super easy to get on and off busy little feet. Fleece lining with faux fur cuff. 25 mm bonded felt frost plug midsole. Rubber outsole with multidirection lug outsole for traction enhancement. Temperature rated to -32&amp#176F/-25&amp#176C. Imported. Measurements: Weight: 11 oz Shaft: 6 in Product measurements were taken using size 9 Toddler, width M. Please note that measurements may vary by size. Weight of footwear is based on a single item, not a pair.